I remember testing out iBooks when I first got my iPad, and promptly dismissing it. I didn’t plan to buy from their store (I prefer to buy DRM-free, or at least DRM-removable) and I planned to use the Kindle app for its sync feature, so I didn’t really see the need. In fact, when my aunt told me she got an iPad and had been using iBooks, I tried to talk her out of it in favor of the Kobo app, so she could share books with her Kobo-owning husband. A techie like me should not underestimate the market share an app can accumulate among their less-techie colleagues just by virtue of being pre-installed. I might be able to debate with my e-book-reading friends about the virtues of the Kobo app versus the Kindle app, but the reality is, most people don’t care and will not seek out alternatives to an app that’s pre-loaded and ready to go. Most of my colleagues are unfortunately not as well-trained as my technology team co-leader and I might like them to be. And my time to go and seek out alternatives and train them is limited. iBooks is there, it’s easy and it’s ready to go. Win! Yes, they all work, to an extent. But the combination of ‘it’s there’ and ‘a five-year-old can figure it out pretty quick’ is a compelling one. I was supervising a small group of kids in an after-school program, and I had one of them reading a beginner book out loud to me within five minutes while his stunned teacher looked on. When she expressed interest in loading further readers for silent reading time, I had some kids’ comic books on there by the time the kids were picked up to go home. Sure, there are bells and whistles that aren’t there—like cross-device syncing. But for what we were doing—just sitting and reading simple books together—we didn’t need it. We were good. It was easy. Sometimes, that’s enough. 3. Advantage: E-Books save space—and labor! 4. Disadvantage: Browsing and sorting options in the store are limited. I was so pleased with the success of my little reading time that I went looking for more of the same. Unfortunately, the iBooks store—like the app store—is a bit of a jumbled mess. I could narrow the categories from all books down to children’s books, then fiction or non-fiction. But that was it! What I wanted were more sub-categories so I could browse for leveled readers, or graphic stories, or comic books. It was tough slogging. They really need to refine the sub-categories and make it easier for people to find similar content to what they’ve been enjoying already. I appreciated the ease of having the book store built into the app. 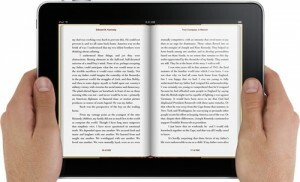 Apple blocks that feature in the Kobo and Kindle apps. But unless you know what you’re looking for, it can be hard to find new stuff. 5. Disadvantage: Kids need more supervision with e-books than with paper books. Unfortunately, my colleague learned the hard way that you can’t just spring an iPad onto a first-grader and let them have at it. There are too many buttons to touch! Several kids found the ‘store’ button a little too easily and went crazy downloading samples (they can’t buy books—or anything—without an admin password). From what I saw, they weren’t even good samples. It wasn’t like there was a certain book they wanted and they tried to find it; it was more like they just went crazy pressing all sorts of buttons for the sake of pressing them. There were some adult books in there. There were some Spanish ones. It was just ‘whee, buttons! Tap tap tap!’ Another iPad was returned to me with over 100 pictures on it of the user’s shoe. It was time and effort removing that. I do think that our in-school iPad program will be finding some cool things to do with iBooks, and I hadn’t anticipated that. Even our most reluctant readers were captivated by the easy readers I found for them to use during tech time. But I’d like to see better parental controls and content refinement options from the vendors, and I’d like to see better-trained teachers who know how to run with this once they hook the kids in. There is work to be done, from all the grown-ups here!